Here’s the thing about a strong heroine: they are far too often overlooked. It’s too easy to look at a gal who is about to topple the baddies and help with the day by simply assuming that she’s there as a supporting character when, in truth, things could go to literal hell without their actions! Now, from an immediate look, people tend to think that poor Sally from Halloween Town simply isn’t going to go anywhere. She’s neglected by all the guys in her life, whether it is Jack who just can’t seem to realize that she’s dreaming of becoming Mrs. Skellington or the sad treatment she gets from Dr. Finkelstein. It’s like they think that becoming the overlord of Christmas is more important than love or that the fact that they literally created you from stitching and stuffing gives them some kind of ownership! Well, fortunately, Sally is a gal with her own mind! Standing tall, confident, and with the remarkable ability to just stitch up and repair any potential harm done to her fine body, Sally is not only ready to help make sure that Halloween Town (and the world) is safe from the threat of Oogie Boogie, but is going to look pretty stylish while doing so. Not just anyone can patch together a dress from remnants and rock it quite like Sally does. And that pasty skin? It’s totally in this year, didn’t you hear? So this Halloween, grab a little Worm's Wort and Nightshade and head out on the Halloween Town with this Sally costume. The short-sleeved dress ties with fabric for an easy fit and features iconic patchwork print that you won’t find anywhere else. 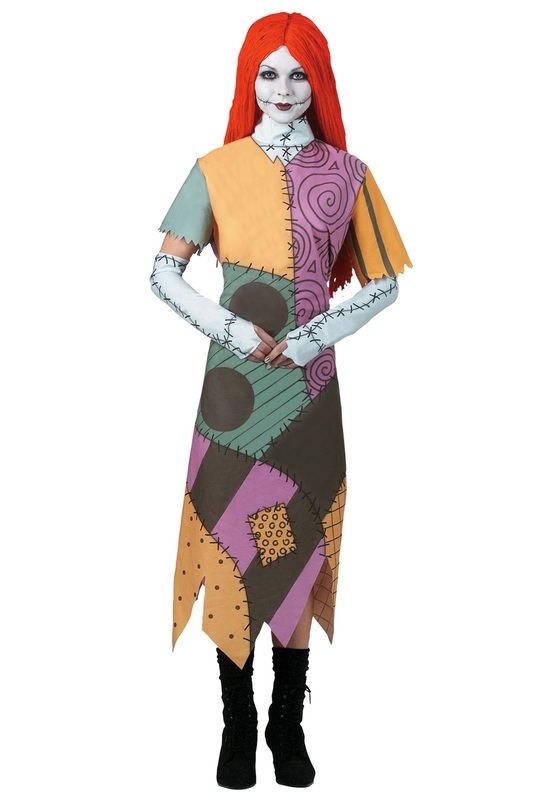 The jagged edges at the hem and sleeves give the perfect edge for a Halloween Doll look while the elbow-length gloves with stitch print starts off the pale look of our favorite ghastly heroine. “But, what about my hair! ?” you are no doubt wondering. Heck, how can anyone match the style that Sally pulls off!? Well, that’s with the included red yarn wig cap that will have you standing toe-to-toe with the queen of stitches! Accessorize further with some pale blue face paint and you’ll have even Jack Skellinton realizing what he’s been missing.